as you may have noticed, Connotea will be shut down at the beginning of March this year (see http://connotea.org/). For those of you who want to keep their bookmarks from Connotea, why not migrate to BibSonomy? In the following, I want to show you how to do it step by step. In BibSonomy, you also can organise and share your bookmarks. We distinguish between publications (for scientific articles, etc.) and bookmarks (for websites). Publications are usually characterized through metadata like title, author, year, abstract, publisher etc. whereas bookmark posts mainly contain a URL and its title. For both of these kinds of posts, you can assign tags as well as a description. Another feature of BibSonomy lies in the social organization of users into followers, friends, spheres and groups, each with separate privacy settings, i.e. you can control almost freely who can see your entries, based on post-level! Fig. 1: Use the proper "export list" link! Fig. 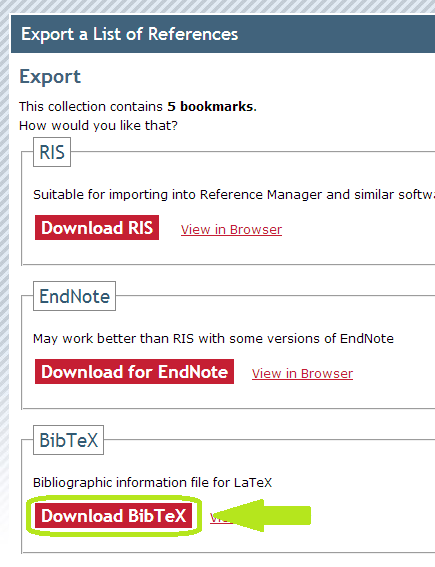 2: Download your bookmarks in BibTeX format. 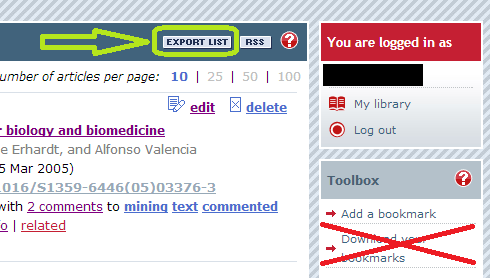 After logging in on the BibSonomy website, you have to open the "post publication" dialog. You can find it on the grey bar in the menu "add post" (see figure 3). Fig. 3: Enter the "post publication" dialog. When the "post publication" dialog opened, open the tab called "upload file". You have to select the exported BibTeX file from Connotea (I hope you still know where it is :-) ) and then hit "post" to upload it and parse the contained information into BibSonomy. Fig. 4: Choose a file to upload. After you've done this, you will notice the parsing results at the bottom of the page, as exemplified in figure 5. In our example, we were able to successfully parse two publications. At this point, they will have already been added to your collection, but you can still change the tags. As you can see in figure 5, the bookmark with a link to "My Google" could not be recognized as a publication, because the BibTeX entry lacked information about authors or a year of publication. Because of this, it has not yet been added to your collection, because our system distinguishes between publications and bookmarks, as we already mentioned above. You first have to download the HTML file exported from Connotea at http://connotea-export.nature.com/exporter. Again, remember where you save the download :-) This HTML file contains a list of links with some information about the posts, which will mostly be ignored, so don't worry much about it. To import these links as bookmarks in BibSonomy, you have to visit the BibSonomy settings page and then select the tab "imports" and follow the instructions. After you have uploaded the file successfully, you will be notified about the successful import. After a click on "home", you should be able to see your new bookmarks in the left column. Hopefully we were able to help you a bit with this blog post! We are happy to welcome you as a new BibSonomy user! Have fun continuing your work and exploring the new features BibSonomy offers to you!